Gosh, that’s a mouthful. 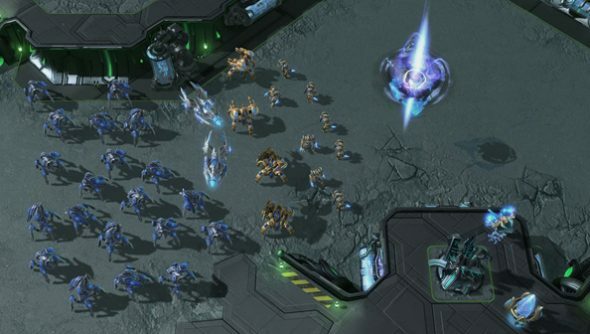 The StarCraft 2 World Championship Series, Blizzard’s first ever hash at a unified annual tournament, has been ticking over for about a month and a half now. Victories have been hard-won, dreams crushed, and it’s about time for the regional finals. They begin next week. The European finals will be hosted by ESL on Saturday May 25 and Sunday May 26, and the American finals by MLG on Saturday June 1 and Sunday June 2. The Korean regionals will play out a little differently, across three weeks. Quarterfinals and semifinals are scheduled for Tuesdays and Thursdays between May 14 and May 23, before the final round is hosted by GomTV on Saturday June 1. The Korean league is actually a little ahead at the moment, having already narrowed its 32 players down to a lean eight. The American and European leagues have 16 combatants left each, due to be paired off and cut down to eight for their respective regional finals. The finals will be live studio matches, in which players fight for seats at the cross-region Season Finals event. Let’s hope they can provide some of those slow-burn player stories that our Rob’s been missing, and that Riot’s LCS provides in spades. All of the regional finals will be broadcast for free, and Blizzard promise more details in the days to come. Will you be tuning in?